The British Supermarine Spitfire and the German Messerschmitt Bf 109 shaped the course of the Second World War. Their rivalry started when they were designed at the same time in the mid-1930s. For both Britain and Germany, they represented the future of aircraft at a time when fighters were all biplanes. When they met in combat, first over Dunkirk, then through their decisive combat in the skies over London on 15 September 1940, and later over the Western Desert, the Russian front, and, finally, over Nazi Germany itself, they proved to be so finely matched that the search for air combat advantage went beyond the fighters themselves. What proved to be most important throughout the duel was the people behind each of the fighters, those who designed, built and flew them. 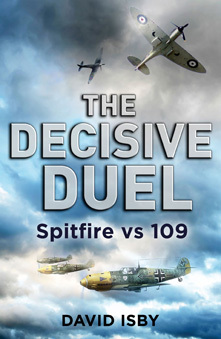 The Decisive Duel: Spitfire vs 109 takes readers on a vivid and exciting journey through how these fighters shaped history from their original design, wartime development, and post-1945 combat up to today, when thousands come to see carefully preserved Spitfires and 109s fly at places such as the Imperial War Museum’s Duxford airfield. The Decisive Duel: Spitfire vs 109 tells a compelling story of a dynamic technology and unforgettable wartime heroism.